Un Chien Andalou I see Un Chien Andalou as being a formalist film. This film is heavily influenced by the directors vision and intent. What a mess!!! 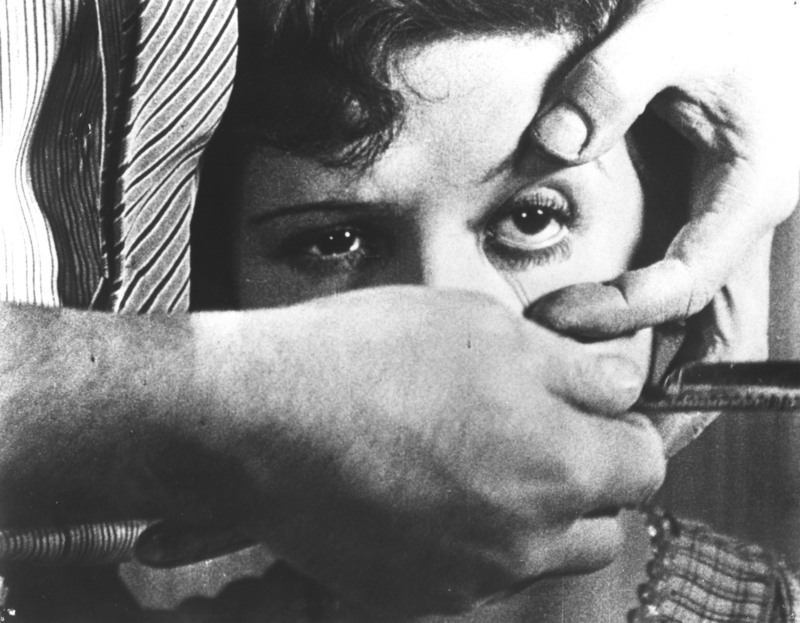 Un Chien Andalou is a little on the disturbing side for me. I felt the movie did not flow very well. Yes, I know that was the intention of the filmmakers, nevertheless, it did not work for me. The editing was all over the place and then you add to the fact that its a silent movie, now you have an audience feeling like they are lost. This film requires its viewers to have very imaginative minds, because it requires it to be so due to its lack of direction and vision. This movie is definitely Avant Garde in its approach and for its time, late 20s, which I felt was a brave attempt at pushing the envelope back then. As interpreted by me, Un Chien Andalou – Experimental I feel that the production of this film was due to a desire from the filmmakers to create a new form of art. The film was co made by an artist, Salvador Dali, who was an abstract artist and it easily seen that his influence was used in the making if this film. I feel that positive reception of this film would be very limited. I feel the preferred reading of this film was a target of artistic flair that was previously unknown in film at that time. I feel that this film lent itself a limited reading due to its lack of direction, although creative and innovative, it still lacked the commercialism that drove the industry. Baraka I loved Baraka!!! I felt the contrasts of images in Baraka were done very tastefully. I believe this film to be a documentary because it does not have any of the directors intentions behind it, only exception being the choice of shots. Its just a lot of un-altered footage taken from around the world showing the world as it is. Man, Nature, and Technology all intertwined together relying on one another for basic survival. I thoroughly enjoyed the time lapse footage of the traffic in the streets of New York and other cities. It reminded me of a colony of ants moving about gathering supplies and food. I also liked the scene where the tribesman were singing and dancing in unison with each other to the drum beat. That scene kind of reminded me of the scene in METROPOLIS when the workers were in line for the elevators. The underground workers were swaying back and forth in unison while exiting and entering the elevators. Its easy to see that Ron Fricke put a lot of care into the cinematography taking note of the time of day assuring the right lighting effects for different shots. There are so many things to like about this film. Baraka – Documentary One would argue that, in part, what contributed to the production of this film was Environmentalism. I personally feel that the filmmakers set out on a journey to discover the world themselves and make a film while setting a new precedent in filmmaking. Since this film was not created with commercialism in mind and was shot on 70mm film, I would think that the preferred reading of this film would be more oriented to a limited number of people who do travel or have a desire to do so. I think of myself as a worldly person, a person with an open mind who accepts little pieces of other cultures and incorporate those into my life. Perhaps thats why I liked the movie so much. Also, the preferred reading could be those who are simply fascinated with distant land and cultures, those who have a desire to learn and discover new customs. The conclusion that can be drawn from watching this film is that we live in a beautiful world and we should take good care of it. Bleak Moments – Narrative I think that the British culture, around the time this film was made, contributed greatly to the production of this film. The oddity of this film reflects the differences between culture and social classes. This film has a limited audience due to its cultural divide. The depiction of the rude Asian waiter at the Chinese restaurant was a reflection of a difference in culture. The preferred reading would involve the balance personal relationships and of caring for a sick family member with the balance of ones own social life paired with the responsibility of caring for another, who is dependant upon that person for survival. The range of preferred reading is narrow.